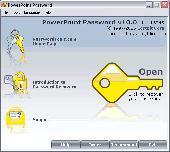 PCWin Note: PowerPoint Password 10.1.6805 download version indexed from servers all over the world. There are inherent dangers in the use of any software available for download on the Internet. PCWin free download center makes no representations as to the content of PowerPoint Password version/build 10.1.6805 is accurate, complete, virus free or do not infringe the rights of any third party. PCWin has not developed this software PowerPoint Password and in no way responsible for the use of the software and any damage done to your systems. You are solely responsible for adequate protection and backup of the data and equipment used in connection with using software PowerPoint Password. Password Generator Pro - Password Generator Pro is a tool that assists users generate easy-to-remember and secure passwords. This password generator generate strong, difficult to break random passwords with various length from 5 to 20 caracters. Aspose.Slides for JasperReports - Aspose.Slides for JasperReports is an external exporter for JasperReports that allows you to convert your reports in PowerPoint presentation (PPT) and slideshow (PPS) formats in your java applications. It supports JasperReports 2.0, 3.0 and higher. Kernel PowerPoint - Repair Powerpoint Files - Kernel PowerPoint is a Microsoft PowerPoint Presentation Repair software designed to recover and restore corrupted Microsoft PowerPoint files. Kernel PowerPoint extracts text even from heavily damaged *.ppt files and never deletes from disk. VBA Password - Universal VBA password recovery. VBA Password has two recovery engines: one is for Word, Excel documents and Access databases, another one allows recovering access to password-protected VBA projects in any application. Stellar Phoenix PowerPoint Recovery - Stellar Phoenix PowerPoint Repair is simple and efficient utility to repair corrupt PowerPoint presentations of MS PowerPoint 2010, 2007, 2003, 2002, and 2000. The tool restores various PowerPoint objects, such as tables, charts, WordArt, forms, etc..
PowerPoint Repair Toolbox - PowerPoint Repair Toolbox delivers fast corrupt PowerPoint file repair solution and is exceptionally simple to use; you're guided through the recovery process using easy-to-understand wizards and on-screen guides. Download PowerPoint Repair Toolbox! PowerKey - PowerKey is an advanced encryption toolkit with many unique features which you won't come across in other products of such a kind available online. It allows you to perform block encryption of files and folders, wipe and other. PowerPoint Password Recovery - PowerPoint Password Recovery is an efficient powrpoint password recovery tool to recover forgotten password for MS PowerPoint 2010/2007/2003/2000/97 files by using 3 powerful password recovery methods. More Software of "LastBit Software"
LangAgent - Increase your revenues, localize your applications with LangAgent! LangAgent automates all localization/proofreading tasks, generates tasks for translators, tracks changes. Add-in for MSVC enables you to apply LangAgent to your projects easily. Act! Password - Password recovery tool, which comes in very handy if you forgot, lost, or misplaced your password for Act! document. Act! Password enable you to cracks your file instantly. Alien Registry Viewer - Alien Registry Viewer is similar to the RegEdit application included into Windows, but unlike RegEdit, it works with standalone registry files. Alien Registry Viewer works with registry files copied from other computers. Excel Password - Utility to recover Microsoft Excel spreadsheet passwords. The Guaranteed Recovery technology unlocks a file within a minute regardless of the password length. All versions of Excel and password types are supported. FTP Password - FTP Password is an universal password recovery tool for FTP accounts. It recovers all FTP logins and passwords stored in your computer by your FTP software. ICQ Password - ICQ Password is a password recovery tool for ICQ. In a few clicks the program will display passwords for all ICQ users on the PC it was launched. No professional knowledge or experience is required. MD5 Password - MD5 Password is a tool for security professionals, which allows recovering a password if you know its MD5 hash. The fast recovery engine can recover up to 32,000 passwords simultaneously. Distributed recovery is supported. MSN Messenger Password - Password recovery tool for MSN Messenger. MSN Password retrieves stored login information for the current computer user. No professional knowledge or experience is required.